Tri-Cities home prices posted moderate year-over-year increases in the Tri-Cities two Metropolitan Statistical Areas in July. CoreLogic’s Home Price Index put the Kingsport-Bristol increase at 3.7%, which was down 0.8% from June. The Johnson City MSA increase was 2.5%, unchanged from June. Tennessee and the U.S. HPI were up 6% from July last year. CoreLogic’s HPI Forecast indicates that home prices will increase by 5.4% on a year-over-year basis from July 16 to July 2017. 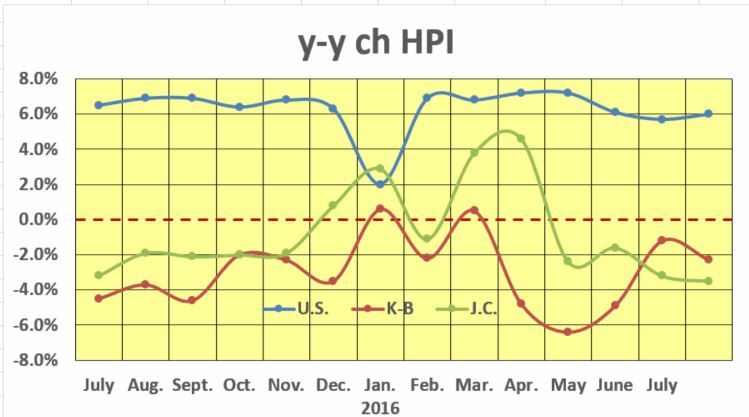 The forecast is a projection of home prices using the CoreLogic HPI and other economic values. Values are derived from state-level forecasts by weighting indices according to the number of owner-occupied households for each state. While the forecast is not available on the local level, if it follows the pattern it has followed since Jan. 2015 the Kingsport-Bristol index would see a July 2016 to July 2017 increase of 2.5% while Johnson City’s increase would be in the neighborhood of 5.1%. THIS CHART ILLUSTRATES SHOWS HOW THE LOCAL HPI’S TRACK AGAINST THE NATIONAL BENCHMARK. IT’S ALSO A REMINDER OF HOW RELYING ON MEDIA INFORMATION THAT USES ONLY THE NATIONAL MARKET DATA CAN DISTORT LOCAL HOUSING MARKET CONDITIONS. CLICKING ON THE CHART RENDERS A LARGER VERSION. Both local MSAs peaked early in the year – Kingsport-Bristol in February followed by Johnson City in March. That peak was followed by a three-month swoon. The trend lines crossed in June with Kingsport-Bristol outperforming Johnson City in June and July. CoreLogic’s HPI is a good benchmark against the Northeast Tennessee Association of Realtors’ Trends Report. The HPI provides measures for multiple market segments, referred to as tiers, based on property type, price, time between sales, loan type (conforming vs. non-conforming) and distressed sales. The Trends Report is a tracking of sales from the local Multiple Listing Service, which accounts for 75% to 80% of the local resale market. While they draw from different data sets the CoreLogic HPI year-over-year trend line, and the Trend Report’s year-to-date average price trend show very similar patterns since April with one exception. 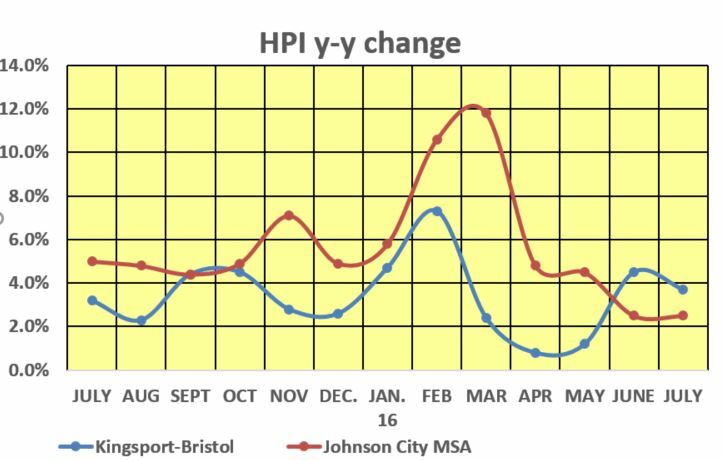 Kingsport-Bristol’s July increase moved that metro area’s trend line higher while the others were moving lower from June.